THIS WEEK’S OTHER FEATURED BOOK, “AVIS HUMPHREY,” BY B.M. SIMPSON, CAN BE FOUND BY SCROLLING DOWN BELOW THIS POST, ALONG WITH THE “FIRST TUESDAY REPLAY.” OR JUST CLICK THE AUTHOR’AS NAME ON OUR AUTHORS PAGE. THE BOOK: The Once and Future Ocean: Notes Toward a New Hydraulic Society. THE PUBLISHER: Leete’s Island Books. SUMMARY: The ocean holds the key to humanity’s survival. At a time when the world faces a multitude of potential calamities, from climate change to a struggling oil industry to rapid population growth, author and environmentalist Peter Neill of the World Ocean Observatory argues that the time is now to begin organizing our social, financial and political order around water in all its forms, places and uses. 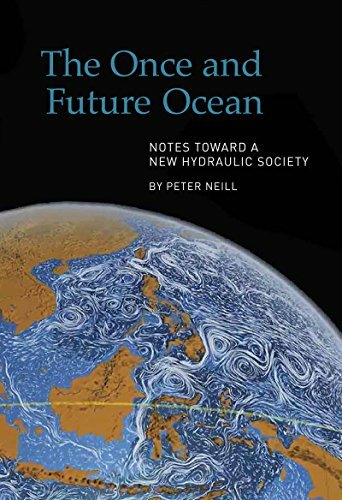 Neill’s new book offers a bold vision for a practical and possible future, based on a revolutionary paradigm shift toward a new hydraulic society that can be implemented through the political will of individuals who understand the necessity for change, the logic of a new moral alternative, and the reality of the consequences if we fail to act in time. Ambitious in scope yet grounded in actionable, specific ideas and solutions for preserving the health of the world ocean, it aspires to do nothing less than transform our relationship with the world’s most promising and imperiled natural element: the ocean and the inter-connected cycles of water, essential for all aspects of human survival. THE ONCE AND FUTURE OCEAN argues for invention and new solutions, for new answers to fundamental questions, and for a new relationship built around the ocean as a source for new modes of living that are within our grasp if only we have the courage to take hold. THE BACK STORY: Many books have long sounded the alarm of environmental degradation and the need for alternative values, structures, and behaviors, but suggested solutions are few. We tend to lament, resist in narrow fields of battle, and watch as vested interests continue to undermine progress and extend the consequences in the evermore critical context of exhausted land, overwhelmed cities, and changing climate. Suddenly the future is at stake. The salt/freshwater continuum is the last natural system with the inherent power to sustain us. It represents a solution that stares us in the face, and may guarantee our future, if we will acknowledge its value and protect it. So, this book was written to present a solution whereby we thrive in the 21st century through innovation and revolutionary change based on the power of Nature. We ignore the opportunity at our peril. WHY THIS TITLE? : We can look at the ocean and read its extensive past as a locus for the exchange of goods, people and ideas, a system that has connected us over time through trade, exploration, immigration, and the sharing of cultural capital. But it is threatened — by complacency, destructive forces, and ignorance. That is the ocean of “once,” a past still essential, but no evermore imperative for our future survival. The future ocean unites the hydraulic systems on earth, relates them to the continuity and success of settlement and civilization, and provokes a new paradigm for living that will sustain a burgeoning global populations with equity, parity, and justice. WHY SOMEONE WOULD WANT TO READ IT: This book is a clarion call for the ocean and fresh water resources, a wake-up to the planet’s inhabitants that it is time for a radical shift and that we need to start now.THE ONCE AND FUTURE OCEAN speaks to everyone and provides guidance on how we can take steps in all aspects of our lives to initiate the changes required to contribute to a new hydraulic society. AUTHOR PROFILE: Peter Neill is founder and director of the World Ocean Observatory, a web-based place of exchange for information and educational services about the health of the ocean. Throughout his career, Mr. Neill has contributed to organizations devoted to marine affairs, education, and culture. He was President of the South Street Seaport Museum from 1985-2004; he is a past President of the Council of American Maritime Museums and the International Congress of Maritime Museums; he is a co-founder of The Sound School, New Haven, Connecticut and The Harbor School, in New York City, two innovative public high schools that use the marine environment as a context for teaching and learning. He is a contributing writer to the New York Daily News environmental pages and the World Ocean Forum. He has appeared in numerous television documentaries on The History Channel, Discovery, and National Geographic Society productions. His other publications include novels (3, 2013; A Time Piece, 1970; Mock Turtle Soup, 1972; Acoma, 1978); non-fiction (Maritime America, 1988; Great Maritime Museums of the World, 1991; On a Painted Ocean, 1998); anthologies (The City: American Experience, 1978; American Sea Writing, 2000); and numerous articles on maritime history and art. In 1972, he founded Leete’s Island Books, a small publishing house specializing in literary reprints, the essay, photography, and profiles of indigenous healers and practitioners of complimentary medicine around the world. Peter has dedicated his career to marine affairs. He lives in downeast Maine with his partner Mary. AUTHOR COMMENTS: If every book is a progress of accidents and influences, then this one began on a miserable day in Cambridge, Massachusetts when I ducked into a used book store to escape the sleet and rain. I found there, in the $1 bin, a copy of “The Ocean, Our Future” the final report of the 1998 Independent World Commission on the Future of the Oceans, chaired by Marios Soares, the former President of Portugal. While that year was the United Nations International Year of the Ocean, the Commission was not a function of that body, deliberately independent lest it be influenced by whatever was the official UN policy for the future of the oceans. The readers of this book, the “Citizens of the Ocean” to whom this book is dedicated, are the perpetrators to come, to take what is provocative and possible from among these thoughts and to put them to meaningful use for you, for your friends, and strangers worldwide who will inevitably come to the ocean for the full spectrum of its beneficence, who will care for it and give back to it, plan a new world around it, and sustain it generations to come. The sea connects all things. We have a private code available for you (Snowflake) to acquire a free ebook. For the free (private) code, please contact me. lf a sample chapter is required for general public and prospective buyers, I can send over a PDF. Please let me know.